Bonnier: Send me the photos and I will paint your cars too. Thanks! I've sent you a PM with a link to photos of four cars from the 1967 season. I got them. They're nice pictures and cars. I already had Bonomi's car on my sights, but the others are a surprise. I haven't gotten that far in my search, beyond some isolated, very famous cases. 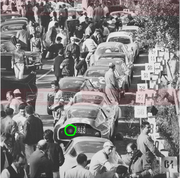 For instance, I had no idea that there were seven of them at the Targa Florio 1965. Cool, looking forward to see what you come up with! The skins are preliminar, changes are coming. Can you guys help me?. #60 car - on some pictures of model cars there is simply an "I" for Italy or "Castrol" on that particular place which obviously is wrong. Yes, I know. Those two are among my primary sites for this car. Targapedia gave me the idea of painting Targa Florio grids. Most of diecast models and slotcars aren't very trustworthy. Worse is the mess with the contradictory chassis numbers and registration plate changes, you can't trust what you find because other sites state the opposite and it's hell to find confirmation. The no. 52 windscreen logo is probably a race registration or scrutineering sticker but it shouldn't be too hard to create something similar since it wouldn't be readable in game anyway. The back panel logo of the no. 60 car shouldn't be that difficult to recreate as well. As for the blue and yellow logo, my guess would be it's some kind of region crest. The car's registration plate says "BA" which is the Bari region. I already have that one, but you're right, I can ask at Targapedia. In the meantime, I'm painting liveries from races that were left behind. Great work - much appreciated! WOW! This is going to be amazing! Looks stunning! Can't wait to give the no. 69 car a go at Ronde Cévenole (which I use as a substitute for the Mugello Stradale track). Thanks, man BTW, what do you think of thet shade of blue? The blue colour looks spot on judging by the model car pics I sent you! The no. 160 Targa entry looks great as well! I first thought that the Scuderia Pegaso entry listed at racingsportscars.com was wrong but it appear to have been a joint entry by Giliberti Corse and the former. It was a mess, that year. The TZs were reclassified as Prototypes. The car #106 was renumbered as #158 and the car #110 as #160. The Nissena (158) and the Sant Ambroeus (162) were withdrawn and there aren't pictures of them that I know of. The cars #106 and #110 didn't race, so I won't paint them. Soze, very much appreciate your work and I especially like your interest in doing historically correct cars. It is good to see motorsport history is kept alive this way. Thank you. Thank you for your words, seniordan. The skins are lacking several stickers that I haven't been able to find yet, plus some adjustments to the models, which will be added later. They're not final versions. I also have outstanding news: Greg7 is doing the physics for this car .